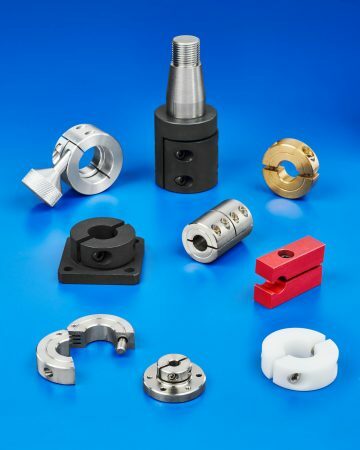 A broad line of standard shaft collars, rigid shaft couplings and problem-solving mechanical components plus the ability to fabricate special parts are available from Stafford Manufacturing Corp. of Wilmington, Mass. Stafford Shaft Collars & Couplings are ideally suited for mechanical design breadboarding because the firm has over 4,000 standard off-the-shelf parts and the ability to engineer and manufacture parts to customer specification. Applications include stops and spacers for guides, rollers, sensors, and many other mechanical and structural mounting components for all types of conveyors, material handling, and packaging machinery and equipment. Included among the standard Stafford Shaft Collars & Couplings is the SPARC System (Stafford Prototype and Repair Collar System) to let users create their own custom solutions within hours and a wide range of 2D and 3D CAD drawings can be downloaded instantly. Special parts can be engineered from a wide range of materials such as superalloys and engineering plastics. Stafford Shaft Collars & Couplings are priced according to material, size, configuration and quantity. Price quotations are available upon request.